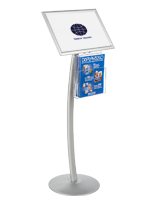 Looking for a durable fixture to feature promotional literature? 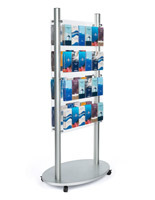 Our metal catalog display racks are made of aluminum or steel for long lasting use in high traffic environments. 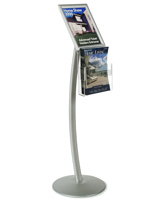 Magazine floor stands, countertop booklet organizers, and wall mounted literature pockets are excellent for featuring promotional materials to visitors and passersby. 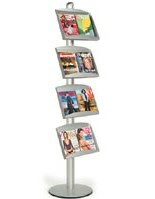 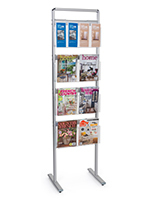 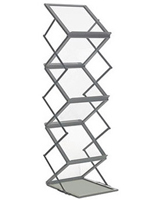 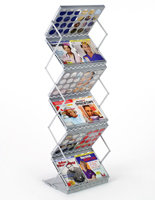 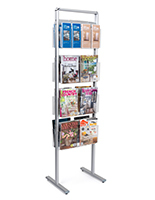 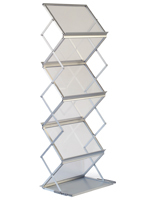 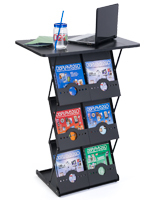 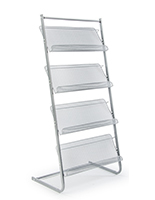 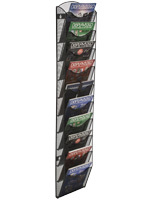 These metal catalog display racks excel at promotion in retail stores, service organizations, and commercial events. 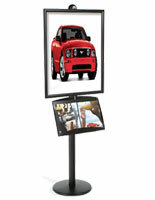 Travel agencies, law offices, and financial institutions will use these to explain and expand on what they offer. 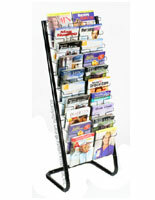 Use metal catalog display racks to drive sales by giving customers more info about products and services. 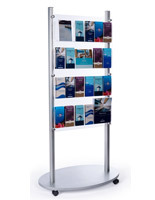 What features are available with these steel and aluminum booklet holders? 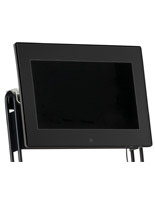 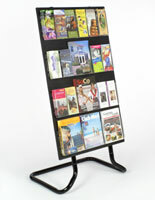 Metal catalog displays with poster frames easily bring attention to promotional materials. 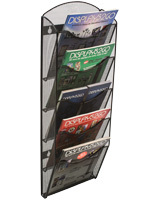 Our freestanding and wall mounted magazine organizers will appeal to your audience from a distance with graphics ranging from 11" x 17" to 24" x 77" in size. 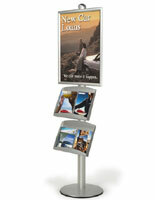 Browse our selection of unique curved fixtures signage for modern advertisers that stand out from the crowd. 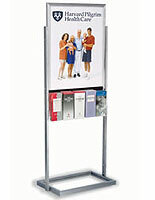 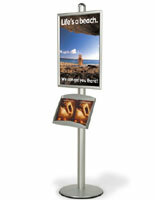 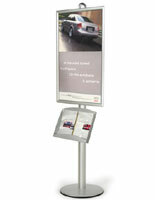 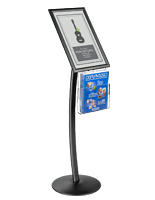 Our floor standing metal catalog displays with double sided designs makes content more accessible to passersby. 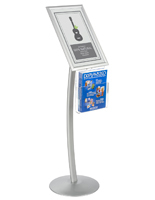 Adapt to large environments such department store floors and mall concourses with these booklet stands that face both directions of traffic. 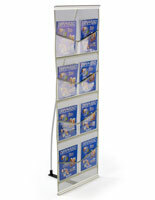 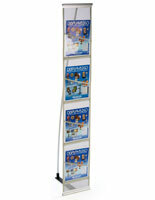 Double sided poster stands with literature pockets will give your marketing materials maximum exposure in open areas. 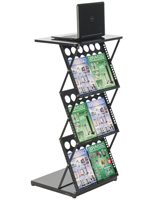 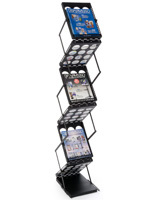 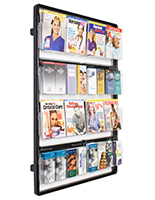 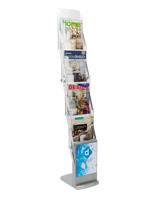 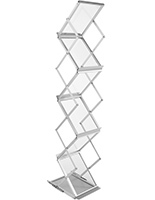 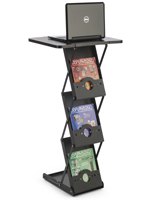 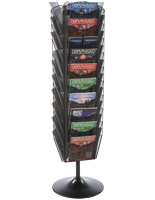 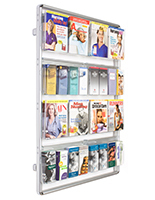 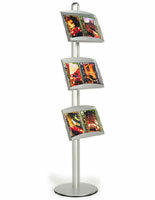 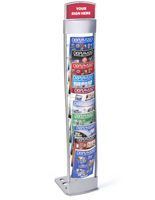 Multi-tiered metal catalog displays can hold large quantities of literature in one place. 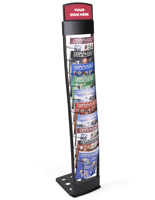 This is great for both selling magazines and dispensing companies' information. 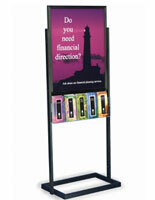 These multi-pocket fixtures represent all organizations in buildings where multiple businesses share the campus. 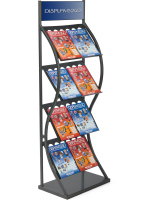 We offer catalog displays with adjustable pocket dividers that can accommodate both magazines and pamphlets. 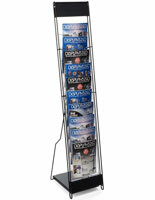 Companies with diversified print media campaigns will make great use of these dual-use takeaway holders. 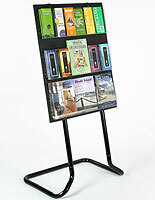 Large organizers can represent all of a business's diverse offerings or feature all the organizations in the building. 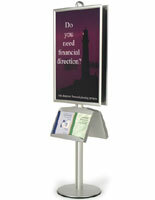 Portable booklet displays are made for use at trade shows and other commercial events. 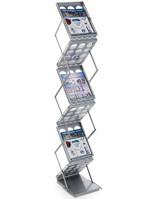 Made with unique folding designs and knockdown frames, these compact holders are easy to transport in spite of their durable fabrications. 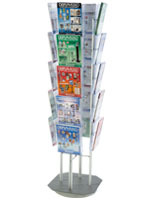 Use portable leaflet stands to promote your brand and its services. 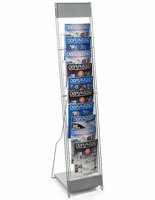 These promotional displays all feature high visibility pockets for displaying media covers with clarity. 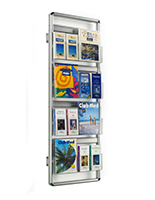 Browse slots made with clear acrylic, steel mesh, and thin wire that all dedicate a majority of the space to your graphics and messaging. 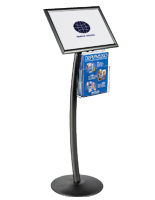 If you want to be sure that visitors and passersby will see your presentation, choose these durable floor stands, counter holders, and wall mounts.